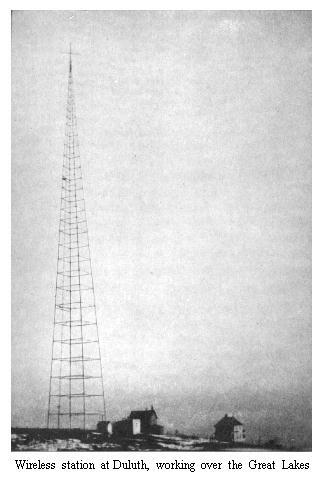 In 1912, virtually all radio stations communicated with each other using the dots-and-dashes of telegraphic codes. However, at this time there were two slightly different versions in common use. Continental code was used throughout most of the world, but American Morse was commonly used in the United States. American Morse was based on the telegraph codes used by land wire telegraphs. The rhythm of the two codes were different enough to be readily identifiable by an operator, and with practice some operators could send and receive both versions of the code. Many characters were the same in both codes, for example, three-dots stood for the letter "S" in both. However, three-dashes meant the letter "O" in Continental Morse, but the digit "5" in American Morse. In 1905, Germany had adopted . . . - - - . . . (three dots/three dashes/three dots, all run together) as a distress signal, and in 1906 this same character string was officially adopted as the international standard for distress calls. If you break up this standard distress signal into three equal parts, it becomes . . . - - - . . . which, in Continental Morse, was the familiar "SOS". But if you were using American Morse, where - - - stands for "5", the distress call becomes "S5S". This is why Collins refers to the "S.5.S." distress signals when talking about events that took place on the U.S. Great Lakes, because American Morse was commonly used there. But, again, this was just a difference in interpretation--the international distress signal was always the continuous string . . . - - - . . . whether transmitted in the ocean or on the Great Lakes. 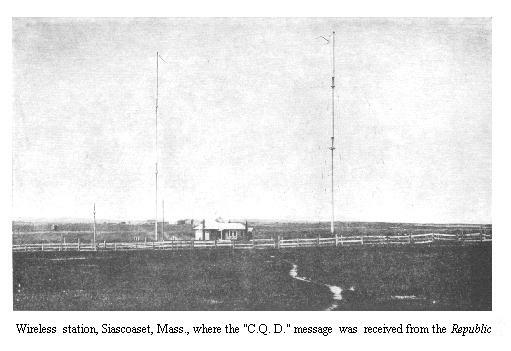 A further complication was due to the fact that Marconi operators resisted adopting the international standard distress call for a number of years, preferring instead to use one their company had adopted, namely "C.Q.D." A final note: "GO" was the callsign used by the United Wireless Station in Chicago, which was located atop the Congress Hotel. SOME STIRRING WIRELESS RESCUES NO fiction can be stranger or more stirring than the actual facts in most stories of wireless rescues. A shipwreck adventure is always absorbing; when the lives of those on board hang by so slender a thread as the wireless signals, our interest is enormously increased. The number of lives saved by timely wireless aid is said to be over ten thousand, while every day lengthens the list. In point of the numbers actually saved, and the difficulties overcome, the wreck of the S.S. Republic is easily the most remarkable. The Republic received her fatal blow from the Florida well out in the Atlantic in the middle of a cold, foggy night in January, 1909. The blow cut deep into the Republic's hull, smashing her upper works to kindlings and killing two of her passengers. Her wireless man, Mr. John R. Binns, who was sleeping in the wireless room at the moment of impact, was awakened by being violently thrown out of his bunk. His first thought was for his apparatus and the delicate aërials at the mast heads. A hasty examination showed that all was still in working order. And then, and not until then, the wireless man looked about to learn the condition of his ship. The wireless room had been badly shattered by the collision, and Binns, looking out through the cracks, saw the deck piled high with wreckage, and beyond a life-boat drifting aimlessly. It was one of the boats which had been swung outboard against accident, and cut adrift by the impact. Without waiting for orders from the bridge Binns started at once sending the wireless call for help, which was afterwards to be so familiar, the famous C.Q.D. Within five minutes the lights were out, lending new terror to the scene. The wireless apparatus went on without interruption. A few minutes later the captain's steward made his way through the wreckage on deck with orders for Binns to report to the bridge. He found the passengers already assembled on deck and the boats swung out. The good news that the wireless was working smoothly was repeated to the passengers, who had taken the sudden awakening with remarkable coolness and the operator hurried back to the wireless room. Immediately the call was picked up by Siasconset on Nantucket Island. It read, "The Republic. We are shipwrecked. Stand by for captain's message." To the anxious operator the reply came back reassuringly a moment later. The wireless man added a friendly note to his message. "All right, old man. Where are you?" was the reply. The first detailed message then followed from the Republic as follows. "Report Republic rammed by unknown steamer 26 miles n. w. Nantucket lightship; badly in need of assistance but no danger of life. Sealby." Within five minutes the shore station informed the Republic that she had sent for the United States Revenue cutter Acushnet then at Wood's Hole, and had notified the Baltic, La Lorraine and City of Everette, which were within striking distance. The steamer which had done all the mischief came out of the fog a little later, and the work of transferring the passengers and crew, upwards of two thousand souls, was commenced. There remained on the Republic, however, the captain, his officers and the wireless man. A long anxious wait followed. The Florida was herself in a precarious condition. The sea, running high, was a continual menace. As the afternoon wore on the weather thickened, and a heavy fog shut out objects even a few feet away. The Baltic approached at top speed and was soon known to be in the immediate vicinity, but for some time the ships could not get a sight of one another. Both ships finally decided to explode bombs to get one another's position to prevent a second collision. Several times the watchers on the Republic even heard the Baltic's fog-horn, but the fog blanket still shut her off. The wireless apparatus was now gradually growing weaker. The last bomb was exploded. Slowly by the most careful maneuvering the Baltic was brought up and the passengers were once more transferred in a dangerous sea to the great steamer. Not until this remarkable transfer was complete did the wireless man abandon his ship, and then only at the express order of his captain. Binns had not been long on board the liner when Captain Sealby decided that the Republic might still be saved. Volunteers were called for to return to the ship. A crew was quickly gathered, including a volunteer cook and of course the indispensable wireless man. Once more on board, Binns went about repairing his apparatus and closing up the badly shattered wireless room by tacking up blankets. For some hours more the diminished company fought to save their ship. The Government boats came up, lines were passed, and the Republic was slowly towed towards land. Only after every hope was gone did the volunteer crew give up the fight. The Republic was already well down when the captain ordered his men to the boats and the ship was for the last time abandoned. Among the records for rapid wireless signaling in time of danger the work of the S.S. Prinz Joachim cannot be equaled. On a particularly thick night the steamer grounded off a remote island of the Bahama group, something more than a thousand miles south of New York. The wireless operator at once sent out the C.Q.D. call with the full force of his apparatus. At such times even under the most favorable conditions the C.Q.D. must be repeated many times. But at the very first call of the Joachim the home station, atop a skyscraper on lower Broadway, signaled that she heard perfectly and was ready to receive a detailed message. By the time the passengers had come on deck to learn the cause of the shock the captain was able to tell them that New York had the news and had flung out a call for ships along the entire length of the Atlantic coast. A few minutes later the wireless stations from New York to Florida could be heard assisting in the search for near-by steamers. Several boats were quickly found in the vicinity, and the nearest of these, a few hours away, was rushing toward them. The tension was instantly relieved. 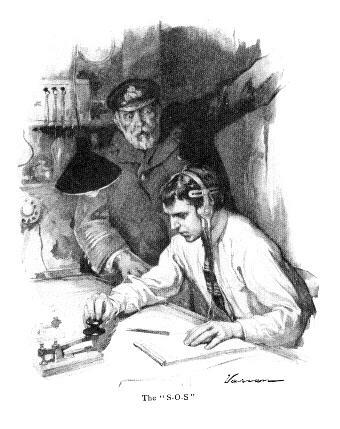 There was no suggestion of the terror which might have spread through the ship's company before the days of wireless. Every one was in the best of spirits. One of the passengers, Mr. William Jennings Bryan, made a speech and suggested amid laughter that they start a republic on a desert island near by, and consider him a candidate for president. A few hours later the passengers were transferred to another steamer and carried on their travels with but a few hours' delay. Photographs taken of the boats as they came alongside the rescuing steamer showed every person in a holiday humor. Some weeks later the Prinz Joachim was successfully floated. Even that ancient terror of all navigators, a fire at sea, has been allayed by wireless telegraphy. Take the case of the passenger steamer Momus, carrying 112 passengers, which took fire off Cape Hatteras. When it was found that the fire was spreading, distress signals were flashed in all directions. A few minutes later a sister ship, the Comus, some seventy-eight miles away, replied. The fire was gaining headway so rapidly that the captain decided to make every effort to reach shore and signaled his course. The steamers hurrying towards them calculated the course which would intercept the burning ship at the earliest possible moment. The two boats came together at two o'clock the following morning. Needless to say no one on board slept that night but on the other hand there was no panic. Most of the passengers assembled in the cabin and sang together to pass the time. Had they not known from the wireless messages that relief would reach them they would have been overwhelmed with terror. All the passengers were taken off in safety. The relief ship then stood by while the Momus ran into shallow water and drowned out the fires. Twelve hours afterwards the water was pumped out and the passengers returned to the Momus, which then proceeded on her regular course. Incidentally, the ship and her cargo valued at $3,000,000 were saved. One of the most remarkable features of this case was the fact that throughout the fire and the subsequent rescue, wireless messages were sent continuously to the general manager of the steamship line in New York who directed the entire operation from his office desk. On the great ocean lanes nowadays there is scarcely an hour, day or night, at any season of the year which finds a well-equipped vessel out of range of assistance. The records of wireless calls for help show that, on the average, such signals bring one or more replies within a few minutes and often the number of vessels responding is much greater. There may be even an embarrassing wealth of offers of assistance, among which the captain of the disabled ship may select his rescuer. There is the case of the Algonquin, for example, which broke her tail-shaft just off Frying-Pan Shoals. She was crowded with passengers and a blizzard was raging, which made the sea look anything but inviting. When the Algonquin was found to be drifting helplessly before the storm, a wireless C.Q.D. was sent out. The anxious listeners had not long to wait. Almost immediately came a response from another passenger steamer further up the coast. Before her passengers could be informed of the situation, came another call, then another and another. In all, nine vessels picked up the first calls and announced their willingness to come up at once. The captain of the Algonquin decided that the San Marcos among the fleet in the vicinity best suited his purpose, and dismissed the others with thanks. The San Marcos soon arrived alongside and the Algonquin was towed into Charleston. With wireless messages flashing over the remotest parts of the seven seas, an adventure like that of the immortal Robinson Crusoe is virtually out of the question. If Crusoe were wrecked on an uninhabited island to-day he would not have time to explore his domains before one or more ships would be rushing to his aid from various points of the compass. Were Crusoe's own experience repeated for instance, the wireless operator would doubtless have plenty of time to notify several near-by ships of the exact latitude and longitude of the island before the men took to the boats. To-day there are several high-power wireless stations within easy range of the island on which Crusoe, or rather Selkirk, lived his lonely life. It will be recalled that Crusoe returned to his ship the day after the storm and gathered valuable provisions. An up-to-date Crusoe, finding himself once again aboard his ship, might test his apparatus, call up the nearest stations and ships and pass the time waiting for relief in listening to the wireless news of the world, including the latest stock exchange quotations. Only a few hundred miles from Juan Fernandez, Crusoe's Island, lies St. Andrew's Island, which was recently the scene of a curious wreck. The steamer Preston loaded with fruit and a large miscellaneous cargo went ashore, lodging on a stony bottom in a very dangerous position. St. Andrew's Island lies well out in the Caribbean Sea, and in the olden days might have kept the ship's company marooned indefinitely. To-day, however, the powerful wireless station at Port Limon, Costa Rica, lies but 170 miles away, which is a trifle to the wireless man. Port Limon picked up the Preston's call for help and passed it on to New Orleans to the agents of the ship. A wrecking-crew was sent out to St. Andrew's Island, which ultimately saved the ship, her crew and cargo. The officers of the steamship company directed the work in detail from their comfortable offices at New Orleans. The stay on the desert island was very short, which in one sense is a pity, since we have lost what otherwise might have been a stirring Crusoe-like story of adventure. The adventures of Robinson Crusoe might have been enacted again on an elaborate scale, with a far larger company of players, on Quadra Island but for the timely aid of the wireless man. Quadra Island lies off the bleak shores of British Columbia and the wreck occurred in a blinding January snow-storm. The steamer Cottage City with a large passenger list was driven upon a dangerous reef. The waves broke over the ship so that it was feared she would quickly go to pieces. The life-boats were manned and the passengers, protecting themselves as best they could against the cold and storm, forsook the warm cabins of the ship for the forbidding shores of the island. The entire ship's company were safely landed, safe so far as the danger of the waves was concerned, upon the snow-covered shores of the island. They sought such shelter as they could find on the lee side of the rocks and discouraging attempts were made to light a fire. The situation was grim enough. In a Robinson Crusoe adventure the temperature makes all the difference in the world. From the moment the ship struck, however, the wireless man had been bombarding the entire Pacific coast with calls for help. There were no ships apparently in striking distance, but the shore stations quickly answered and passed the alarm to the nearest ports. Within a few minutes salvage steamers had put out from Victoria, B. C., and from Port Townsend, Washington, for Quadra Island and its temporary population. A few hours later the last of the passengers had been taken aboard none the worse for their little shore excursion. If at first the wireless operator does not succeed in summoning assistance, a repetition of his call almost invariably discovers an abundance of help, as in the case of the steamer Caris, whose machinery broke down off Cape Hatteras. The seas run thereabouts in swift, dangerous currents, rendering it one of the worst places in the world for a drifting ship. Fortunately the depth of the water allowed her to anchor, but although the ground tackle held fairly well, the ship was continually beaten upon by the waves. The first ship to reach her was the Comanchee, which prepared to tow her into the nearest port. The seas continued so high, however, that one line after another parted until the supply of both ships was used up. The wireless sent out a call for help. In a few minutes the Sabine answered, and instantly put about to the rescue, only to find that her hawsers were too short for the purpose. Still another wireless call was sent out. Again came an almost immediate response, this time from the Apache. The exact plight of the Caris was described and the Apache signaled back that she had the proper hawsers aboard and would come up at once. The third ship proved equal to the occasion. The Caris was made fast and towed safely into Wilmington, North Carolina, none the worse for her buffeting from the Hatteras seas. The unusual number of passengers imperiled in the wrecks of the Merida and the Admiral Farragut, render this one of the most important of the wireless rescues. The ships came together off the Virginia Capes. A great hole was torn in the side of the Merida, at her most vulnerable point amidships. The sea rushed in with terrifying volume, her fires were almost instantly extinguished, and the dynamos stopped. The wireless apparatus on the Farragut was also torn down. The wireless man, nevertheless, proved equal to the emergency. Working with feverish haste, he succeeded in replacing the wires and distress signals were sent out a few minutes after the accident. The calls were soon answered by U.S.S. Iowa and the Hamilton, some seventy-five miles away, both ships turning at once towards the scene of the accident. A thick fog, spread over the sea, made it difficult to locate the exact point, but the Farragut finally succeeded in bringing the two ships alongside. The Hamilton arrived first and the 337 passengers of both the injured vessels were taken off without accident and carried to Norfolk. Shortly after, the Merida sank in thirty-five fathoms of water. The battle-ship convoyed the Farragut safely to New York. In scores of instances, the wireless has proved an invaluable aid to the coast-guard of the government life-saving service. The shore stations are connected by telephone or telegraph wires, while the wireless links this long chain with the ships far out at sea. The life-saving station at Egg Harbor one winter night sighted the schooner Ann J. Trainer out at sea, dismantled and in a sinking condition but lying too far out to be reached. A number of attempts were made to get the life-boats through the surf, but the task was hopeless. A few years ago nothing could have been done but build a fire on the beach and watch the ship break up. It was the work of a few minutes to notify Atlantic City by telegraph and wireless distress signals were soon being flashed far out to sea. The call was read by the operator on the Jamestown, which at once turned on its course and made for the schooner at Egg Harbor. She reached her and made ready to take off the crew if necessary. It was found, however, that the schooner might hold together until wrecking tugs arrived. A wireless call for tugs was then sent out and as these arrived in time, the schooner, as well as her crew, was saved. Throughout the Great Lakes an immense fleet of ships is despatched and controlled like so many railroad trains. The wireless man who takes the part of train or rather ship-despatcher operates from a great skyscraper in Chicago. His control reaches from Duluth to Buffalo. From the time a ship leaves port until she is safely docked at her destination, she is rarely out of direct communication with her owners. Every ship leaving Chicago, for instance, reports every two hours, so that the wireless man can locate a vessel and instruct her commander exactly as a train despatcher controls the conductors of trains throughout his division. The general formation of these great inland seas is well suited for purposes of wireless control. The distance separating a ship even in mid-lake from shore assures good wireless communication. The great stations which pick up distress signals can readily communicate with harbors in the general vicinity of the wreck, so that assistance from shore can be rushed within a few hours. The lakes are besides so populous with ships that a call for assistance cannot go many minutes unheeded. Throughout these waters the call for help consists of three dots, three dashes and three dots, which in the Morse code reads S. 5. S. Chicago's call, which may be flung to the farthest corner of the Great Lakes, is Go. For a vessel in distress anywhere in these treacherous seas the most welcome message in the world is the powerful Go, Go, Go, Go, from the great station at Chicago. Instantly the attention of headquarters has been gained a well organized service for relief is set in motion and help is near at hand. The rescue of the Puritan of Chicago in the fall of 1909 illustrates how quickly all this machinery may be set in motion. The Puritan, carrying a crew of forty, and fifteen passengers, was disabled some twenty-seven miles off St. Joseph, Michigan, by the breaking of her steering-gear. A high sea was running and the vessel was drifting perilously near a sand bar. Her S. 5. S. was picked up almost instantly by Chicago, and her owners were placed in direct communication with the ship. A glance at the wireless log showed the position of all the ships in the vicinity of the Puritan. The vessel nearest the scene of the wreck chanced to be a sister ship, the Benton Harbor. Within a few minutes after the first distress call was sent out the captain of the Benton Harbor received instructions to proceed at full speed to the Puritan. The captain of the disabled ship meanwhile had been able to assure his passengers that assistance was being rushed to them and a panic was avoided. So far the work had been a regular routine matter, but as the Benton Harbor neared the Puritan the buffeting of the seas became so violent that the rescuing steamer began to fear for her own safety. Her captain now took advantage of the wireless apparatus, which worked perfectly throughout the storm, to inform the ship's owners at Chicago of the exact condition of his ship. The owners thereupon consulted the Puritan and found that although she was drifting towards shore she would still be in comparatively safe water for several hours. The Benton Harbor was thereupon ordered back to port and a special wrecking tug despatched to the Puritan. Here the wireless doubtless prevented a double disaster. When the tug reached the Puritan the wind and sea were so high that it was found impossible to tow her. Hawsers were passed to the ship, and she was held against the wind until the storm had partially blown itself out when she was taken to port. Every detail of the work was directed by the ship's owners at Chicago. Throughout the winter months the Great Lakes are menaced by dangerous ice-floes. There are no icebergs, such as drift down from the Polar region into the Atlantic lanes, but the ice-fields driven by high winds have caused many bad wrecks. Before the days of the wireless man many ships were carried along in these drifting ice-floes and gradually ground to pieces before assistance could reach them. The rescue of the Arizona recently in the middle of Lake Michigan affords a good illustration. She had sailed from Chicago one January day and was only about thirty miles out when an explosion blew out the cylinder heads of her engine. The steamer at once drifted helplessly about in a large ice-floe. The Arizona's S. 5. S. was picked up instantly by Chicago whose Go, Go, Go, Go, a moment later, came reassuringly across the icy waters. Chicago's call soon picked up the Indiana which was near by and she was directed to stand by to assist the Arizona few minutes later the call was answered by the Iowa south-bound from Milwaukee. Here was a choice of rescuers. The Indiana was notified that her services would not be required and the Iowa preceded to tow the disabled ship into port. Measured by the number of lives saved the wreck of the City of Racine is one of the most important achievements of the wireless in these waters. Carrying two hundred passengers and a large crew, she was plying between Milwaukee and Chicago when the breaking of her propeller rendered her helpless. Her distress signal was picked up almost at the same instant by the steamers Chicago and Christopher Columbus which put about and steamed at top speed to the rescue. It promised to be a slow, tedious affair to tow her into port and her passengers were transferred in midlake to the Chicago which put into Milwaukee, delaying them but a few hours. The City of Racine was towed by the Milwaukee into Chicago. Let the wireless distress call be flung out in any sea, and every other instrument in range will be instantly silenced. All other forms of wireless communication are cut off and the operators stand by to lend all possible assistance. In such cases time is likely to be priceless, and by common consent all stations within range instantly place themselves at the disposal of the operator sending the call. As a rule the C.Q.D. or S.O.S. is first sent out several times, followed by the latitude and longitude of the ship's position. If the ships or stations receiving this information should be suddenly cut off, or the sending apparatus break down, the most vital information would have been received. After the ship's position has been given, and not until then, the operator sends his ship's call and the name of his vessel. The latitude and longitude is then repeated and after four or five calls the C.Q.D. or S.O.S. is repeated. This is continued until a reply has been received, when the operator sends briefly the condition of his ship and whatever directions the captain may see fit to give. Following an unwritten law of the sea the first station whether on shipboard or ashore receiving the call of distress immediately notifies all other stations within range. Should the ship in distress continue to have control of its wireless apparatus it becomes by common consent the controlling station. This means that the captain of the ship in distress shall give orders and directions for bringing up assistance, and that all other wireless stations within range shall follow his direction. If there be time enough, the captain summons a ship of the same line to lend assistance, since this saves great sums in salvage. Should the ship be near a land station of greater range, which can cover a larger radius, it becomes the controlling station. And of course should the wireless apparatus of the ship sending the distress signal go out of order through the stopping of machinery or the flooding of the ship, the vessel or shore station within easiest reach becomes the controlling station. This station keeps the owner of the ship informed, directs the movements of rescuing steamers, answers inquiries about passengers and transmits wireless messages to the newspapers. 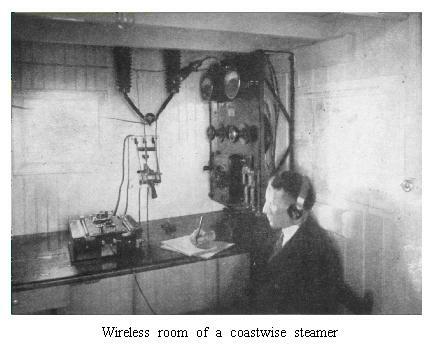 Following the loss of the Titanic an earnest investigation was made into wireless conditions at sea, with a view to increasing the efficiency of the service. It is a matter of record that the Titanic's wireless call for help was read by not less than twenty stations. Had the system of wireless communication been better organized, it is now generally admitted, the great tragedy might have been avoided. Within a few weeks virtually all the great maritime nations prepared new wireless regulations, many of which have become laws. The United States Government was the first to order such an investigation, and the rules afterwards adopted are extremely rigid. In addition to the Government regulations, the Secretary of Commerce and Labor is given power to abridge the law as he sees fit, without waiting for the action of Congress, should new conditions arise. All wireless stations under this law are required to give absolute priority to signals and radiograms relating to ships in distress. On hearing such a message they must cease all sending until all the signed wireless messages relating to the ships are concluded. The only use which may be made of the station throughout this time is to answer the calls of the disabled ship and relay them or lend such assistance as is possible. Every station is required to designate its normal sending and receiving wave length. This is made a matter of record, so that other stations will know how to tune their instruments to communicate with it. Every station, open to general public service, must at all times be ready to receive wireless messages of the wave length required by the Berlin convention. The distress signal call must be the international signal of distress. Every station on shipboard or ashore must be prepared to transmit distress signals for at least one hundred nautical miles. All stations in close proximity are forbidden to send or receive messages which interfere with Government transmission during the last fifteen minutes of each hour. All wireless stations, besides, are required under penalty to exchange wireless messages with all other stations without distinction against any nation using any radio system. Experiments are being carried on at present with a wireless alarm bell which is expected to make the apparatus partially automatic. In many of the smaller wireless stations, both on shipboard and ashore, it is scarcely practicable to have more than one operator. Such a station for some part of the day must therefore be dead, since the wireless man cannot, of course, work continuously without sleep. This is partially overcome by having fixed hours, when the wireless man is on duty. It might very well happen, of course, that a ship would send out her call for help during one of these dead periods and remain unanswered. A vessel, suddenly overtaken, might even go down while a ship was but a few miles away while the operator slept. It will be recalled that the wireless man on the Carpathia was working overtime when he picked up the Titanic's call for help, and except for this accident, might not have received the message at all. The wireless bell will be rung by the distress signal even at a distance of hundreds of miles. And it will ring loud enough, it is promised, to waken the wireless man who will presumably be sleeping within sound of it. The plan which has been devised by Marconi is to transmit a long dash or sequence of waves which will last for a period of fifteen, twenty or thirty seconds. This will give the bell a prolonged ring, quite sufficient to spread the alarm. Once this extraordinary alarm clock has been started, it will be a very simple matter to readjust the instrument to receive the details of the danger from the vessel in distress.